Powered by Ethereum smart contracts, Betex brings indisputable transparency, fair conduct, and audible results to the binary options trading. With Betex, traders will be placing bets against each other and never against platform providers or any other intermediaries. Built with Blockchain technology, unlike traditional platforms, Betex will provide access to real-time data, thereby, ensuring absolute transparency of its system. So there is no doubt that all users are treated equally and fairly. Users will be forming one large common pool of liquidity for each underlying asset in order to maximize users' gain. The platform's commission will be 5% only, the liquidity will be derived from a common pool of brokers, and brokers themselves will integrate into the platform via the white label mechanism. This is the only platform, where as much as 95% of funds are distributed among traders who make correct assumptions. 2.5% (half of the platform's commission 5%) of the total platform turnover will be distributed among the holders of BETEX tokens, accordingly to the number of tokens they own. 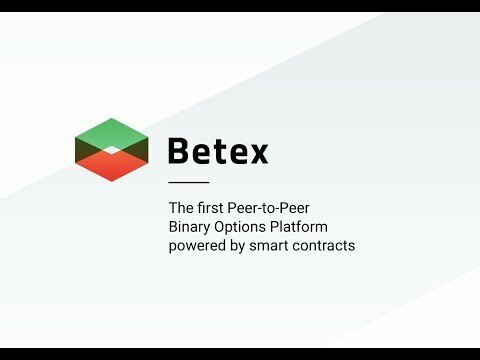 Betex was built with a mission of bringing clear-cut transparency to the financial derivatives markets as well as creating brand new instruments that would finally put an end to obsolete shady schemes. So now we are proud to introduce our leading-edge platform for peer-to-peer binary options, powered with Ethereum smart contracts. Thousands of brokers and traders worldwide were massively employing this instrument back then. It was greatly favored for the simplicity of concept and high chances of success. The industry was experiencing exponential growth until 2014, reaching over $30 billion in its annual turnover. But something went wrong there. In the following years, regulators from all over the world have been making rather strong statements, claiming that binary options is a deceit and discouraging traders to get involved. Evidently, a great concept behind Binary Options has been ruined by shady, dishonest brokers, their lust for gain and the fact that there are limitless possibilities for them to deceive their customers. We have got good news for you, though. We are launching a revolutionary peer-to-peer platform for binary options, BETEX, that will substantially improve the way betting is done. We designed a radically new business model to shift user mindset from worrying about the integrity of platform providers to focusing on own capacity to make profit. With Betex, traders will be placing bets against each other and never against platform providers or any other intermediaries. Built with Blockchain technology, unlike traditional platforms, Betex will provide access to real-time data, thereby, ensuring absolute transparency of its system. So there is no doubt that all users are treated equally and fairly. Users will be forming one large common pool of liquidity for each underlying asset in order to maximize users‟ gain. The platform‟s commission will be 5% only, the liquidity will be derived from a common pool of brokers, and brokers themselves will integrate into the platform via the white label mechanism. This is the only platform, where as much as 95% of funds are distributed among traders who make correct assumptions.